Great News for the Home Lawn and Gardener! Double Even Triple The Days Between Required Watering and Enjoy The Benefits Of Proper Moisture Management! After 9 years of commercial use by golf courses, nurseries, sod farms and top landscapers, Aqualizer is now available to homeowners. Aqualizer is a revolutionary new chemistry that allows homeowners to water up to 50% less and maintain healthy, great looking plants and turf. Just like our bodies plants need a continual source of water to grow and remain healthy. Even during times of normal rainfall and in between scheduled waterings plants can suffer from a lack of sufficient water, known as “drought stress”. Unfortunately by the time the first visible sign of drought stress appears plants’ and turf grasses' internal processes (photosynthesis, carbohydrate translocation, cell differentiation, cell elongation, & cell division) have ceased. This complete shutdown of the physiological processes results in weak, under-developed plants, that are prone to diseases, nutrient deficiencies, shallow roots, reduced flowering and poor crop yields. Ultimately the overall quality of your plants and lawn suffers. Aqualizer is the solution. 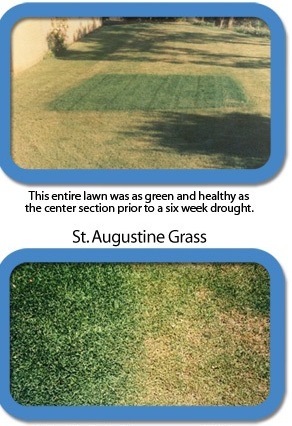 Aqualizer manages root zone moisture, making the most efficient use of applied water, rain, etc. Its simple mechanism protects turf and plants from the harmful effects of drought stress, reducing disease pressure and root shrinkage. Aqualizer will result in healthy, disease resistant plants that will improve the overall quality of your lawn, landscaping and vegetable gardens. 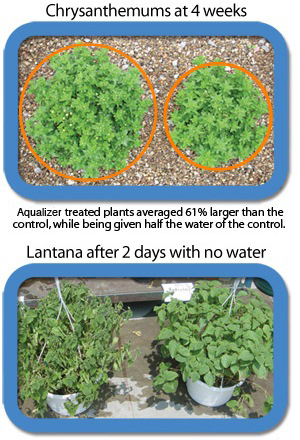 Aqualizer does not hold excess water in the root zone and therefore does not promote disease. It also will not change the water holding capacity or percolation of the soil matrix (except in the case of severely hydrophobic soils as above). Aqualizer is not a wetting agent, polymer, penetrant, or antitranspirant. No other product has the ability to actually attract free water molecules and then release them through osmosis into the roots of your turf. It is a truly unique compound that has no equal. Trees, Shrubs and Individual Plants: Apply enough Aqualizer to thoroughly saturate the soil throughout the root zone. Large Planters, Flowers and Vegetable Gardens. Re-watering Aqualizer Treated Plants and Grass: Aqualizer extends watering requirements by managing excess moisture. Therefore, for maximum effect, it is important to water thoroughly when re-watering Aqualizer-treated areas, providing excess subsurface moisture for Aqualizer to manage. Aqualizer is biodegradable. Re-application every three months allows Aqualizer to build up in the soil profile, providing even greater drought resistance with each application. Aqualizer is organic and fully biodegradable. It contains no phosphates, petrochemical derivatives or other toxic fractions, which may cause ground water runoff contamination. Aqualizer begins to break down in approximately 90 days. Re-application every 90 days allows Aqualizer to build up in the soil profile providing even greater drought resistance with each application. Click below to order Aqualizer now and protect your lawn and garden from the harmful effects of drought.